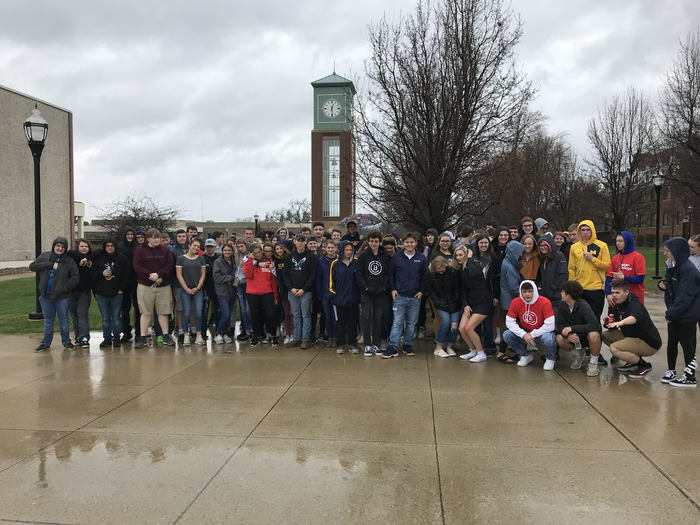 On Thursday, Columbia Central Juniors attended the campuses of Jackson College, Baker College and Spring Arbor University! Thank you for hosting our school! 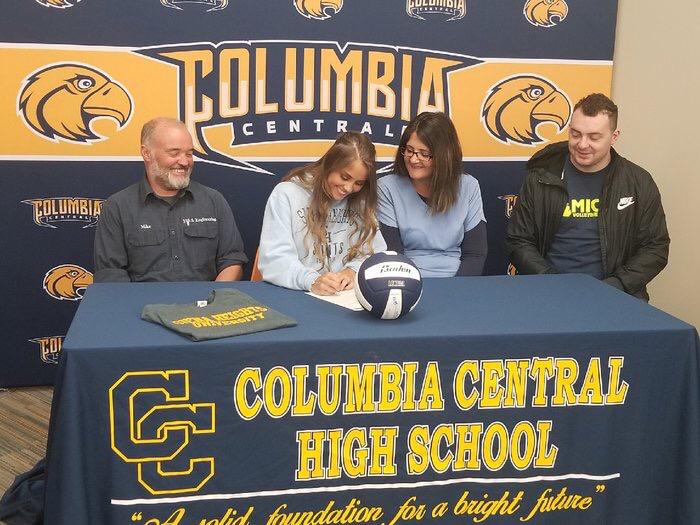 Congratulations to Samantha Huddleston, Columbia Central Senior, for signing with Sienna Heights University! We are so proud of your accomplishments and wish you the best of luck in your future! Way to go! 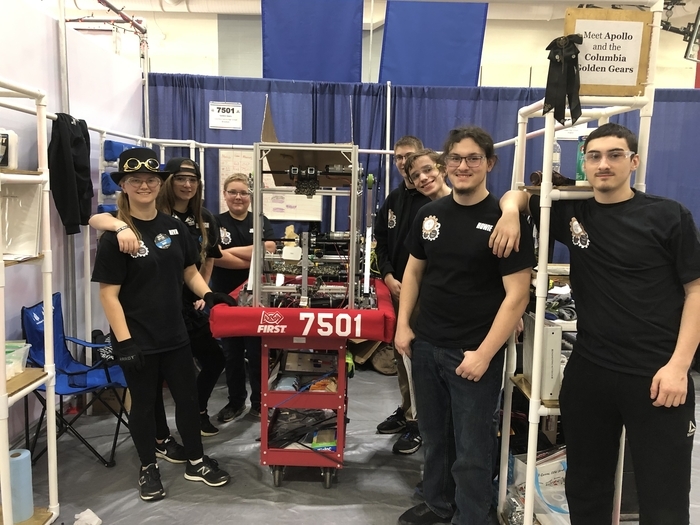 Congratulations to the CCHS Robotics Team who competed at the state tournament this past weekend! They did a fantastic job! 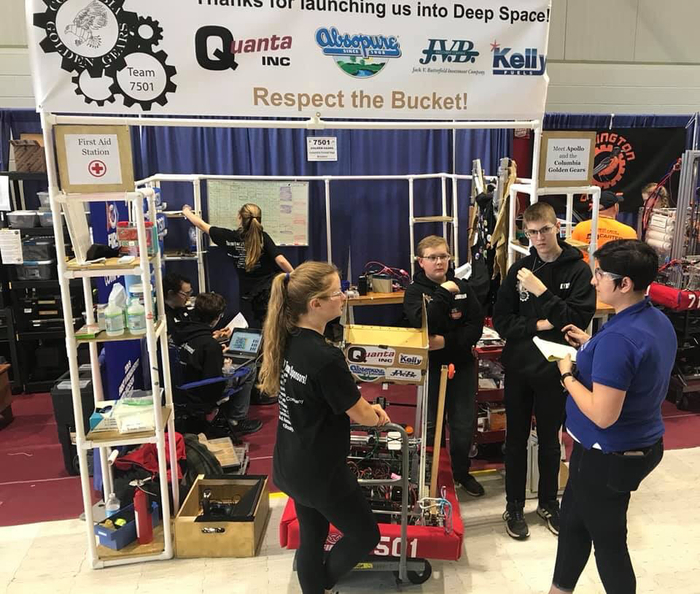 The team will be recruiting 8th grade students and up who are interested in robotics and gaining access to $80 million in scholarships. Go Golden Gears! Chicago Music Trip Day 2! The group visited the Bean at Millennium Park, then enjoyed a performance by the Blue Man Group this afternoon. They will finish up seeing the production of Hamilton! Attention Seniors-Jostens will be delivering graduation announcements on April 18. Caps & gowns will be provided at graduation practice. 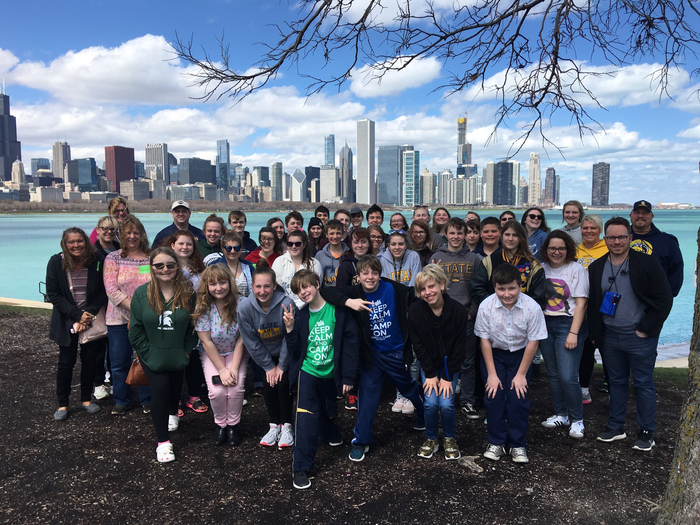 Music Trip 2019- The CCHS Music Department is enjoying a trip to Chicago this weekend. Today, they visited the Field Museum, Museum of Natural History, and Medieval Times! Attention Seniors-We are collecting pictures for your Senior Video. We are asking for one baby photo as well as a Senior Picture. You may bring them in to the office with your name on them or email to Mrs. O'Neil. Thank you! 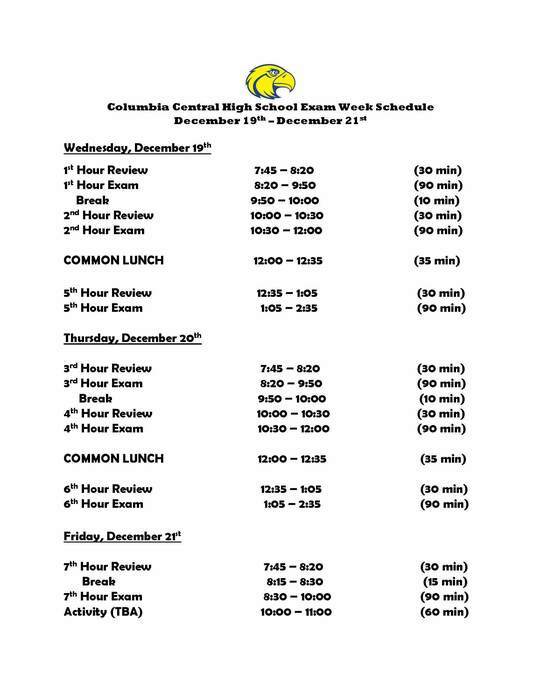 Testing will continue for Columbia Central Juniors on Thursday. We will begin at 8 AM. Free breakfast will be served from 7:30 AM-7:55 AM. 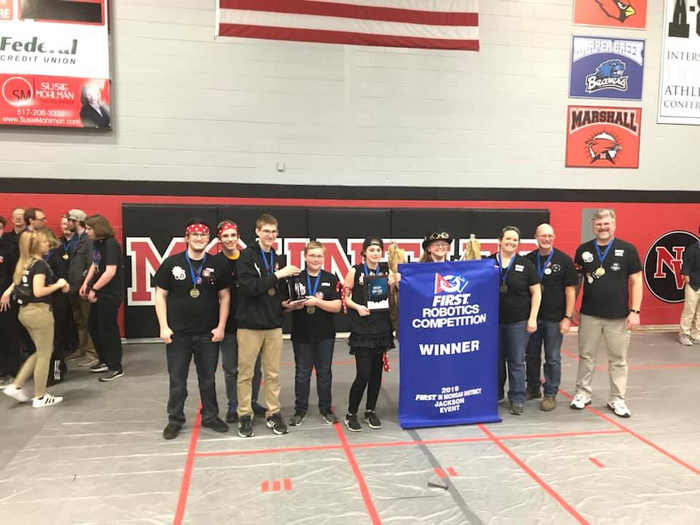 Good luck to the Golden Gears Robotics Team who will compete in the state tournament, April 10-13. The event will be held in Saginaw, MI. We wish them the best! Go CC! 11 grade students will continue testing tomorrow beginning at 8 AM. A free breakfast will be served from 7:30-7:55 AM. A regular class schedule will follow testing. The Jackson County Early College Fall enrollment deadline for all materials and the on-line application is May 1. Please contact the counseling office with any questions. Students in grades 8-11 will be participate in testing tomorrow beginning at 8 AM. A free breakfast will be served from 7:30-7:55 AM. Golden Gears WIN! They will compete in the state tournament, April 10-13. We are so proud of your hard work and success! Way to go CC! Congratulations to our Business Professionals of America students who competed in the CEO Challenge today! These students placed in the top 5. We are so proud of your hard work. Way to go CC! 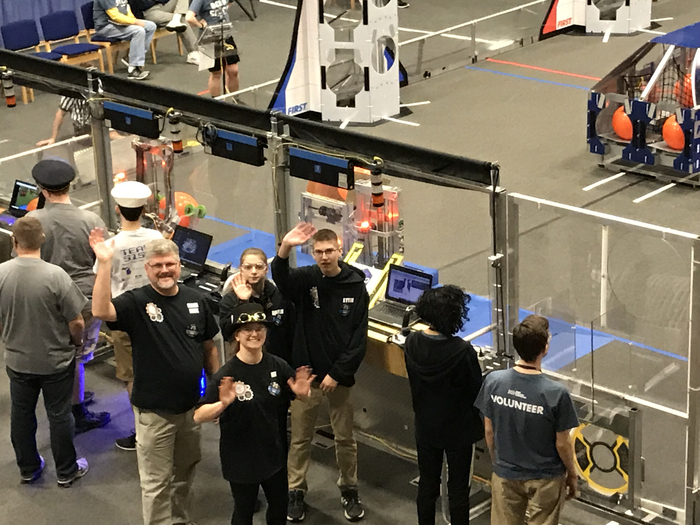 The CCHS Robotics Team, Golden Gears, have made it to the finals! We are so proud of your hard work. Way to go CC! There will be a parent meeting on Monday, 6 PM, for any 9th/10th grade student interested in attending Jackson County Early College in the Fall. The meeting will be held in library. There is NO Saturday School tomorrow, March 23. The next session will be held April 13. Columbia Central High School Leadership Class will host a Blood Drive tomorrow from 8:30 AM-3 PM in the gymnasium. 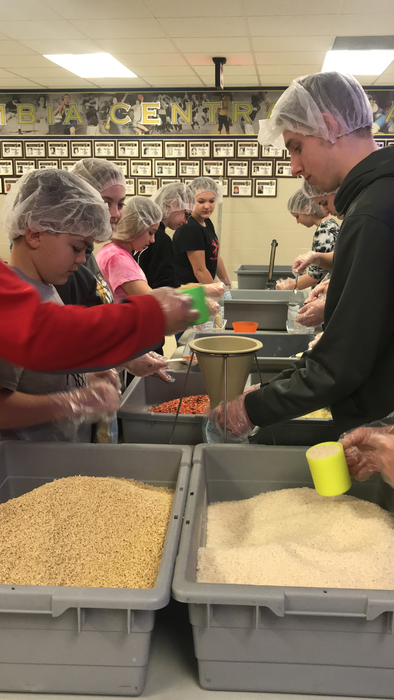 Thank you to the Kids Coalition Against Hunger for sharing the opportunity to support our local communities and beyond. 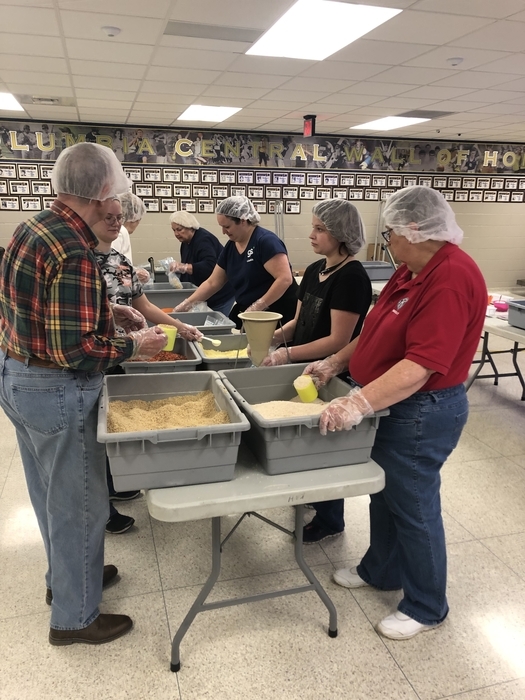 Each meal bag packed today feeds up to 6 adults or 12 children. 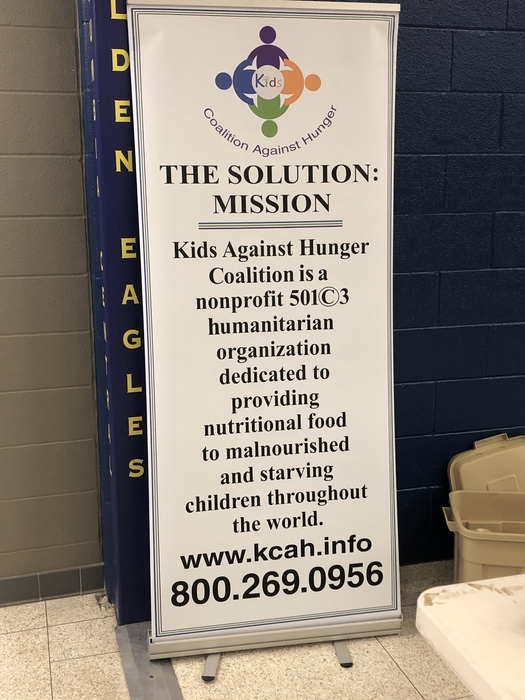 Thank you @KidsCoalitionAgainstHunger! Columbia Central Seniors-Scholarship deadlines are quickly approaching. Please go wdiefenthaler.weebly.com for more information on how to apply. Please stop in the counseling office with questions. 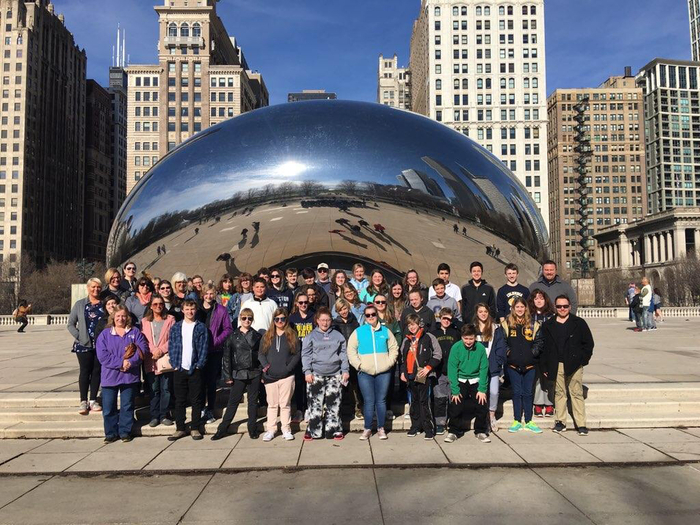 There are a few more spots open for the Music Department Chicago Trip on April 12-14th. The trip Includes Hamilton Tickets, Blue Man Group, Medieval Times, and more! The meeting will be held on Tuesday evening, 6 pm, in the Choir Room. 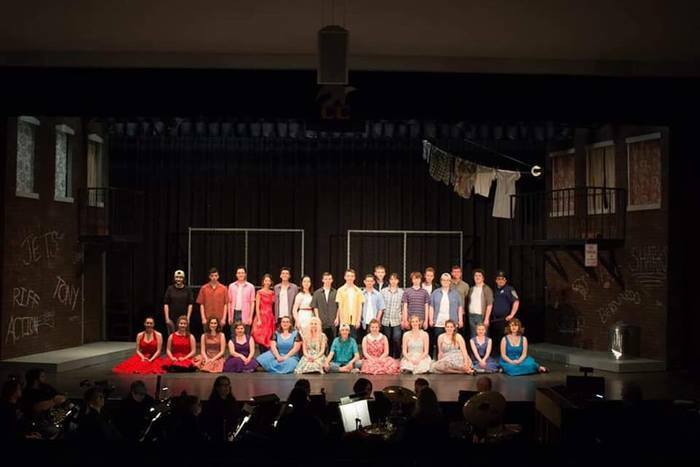 Please join us for the final performance of West Side Story and the Student Art Show today at 2 PM in the Columbia Central High School Performing Arts Center. Both are amazing! Congratulations to all of our students involved in both! Way to go CC! Congratulations to Mr. Parkinson and the Business Professionals of America. They competed in the State tournament over the weekend and did an outstanding job. Way to go CC! 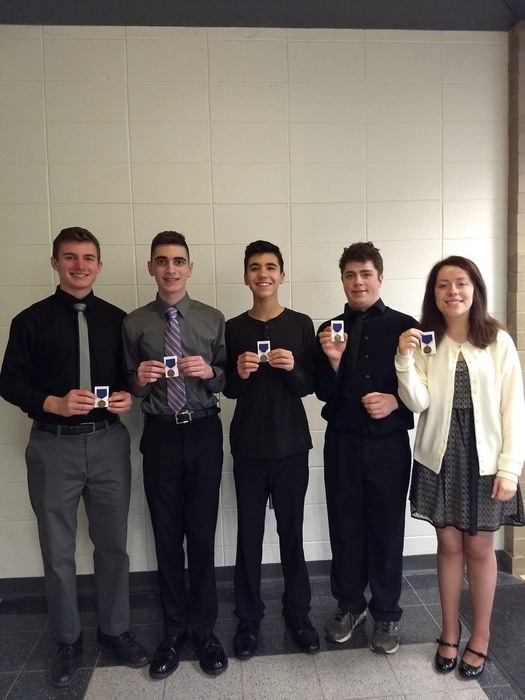 Congratulations to our Brass and Saxophone Quintet who earned a Superior Rating at Solo and Ensemble this weekend! Way to go CC! 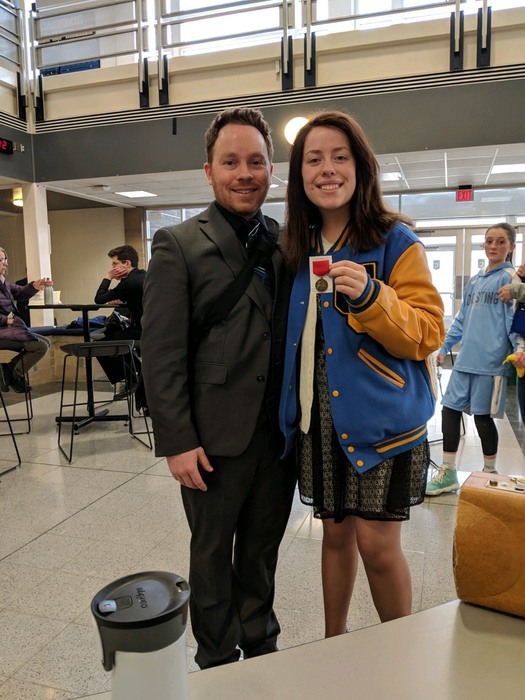 Congratulations to Columbia Central Senior, Katie Schneider, who earned an Excellent rating on her Proficiency 1 Trump Solo this weekend at Solo and Ensemble. Way to go Katie! 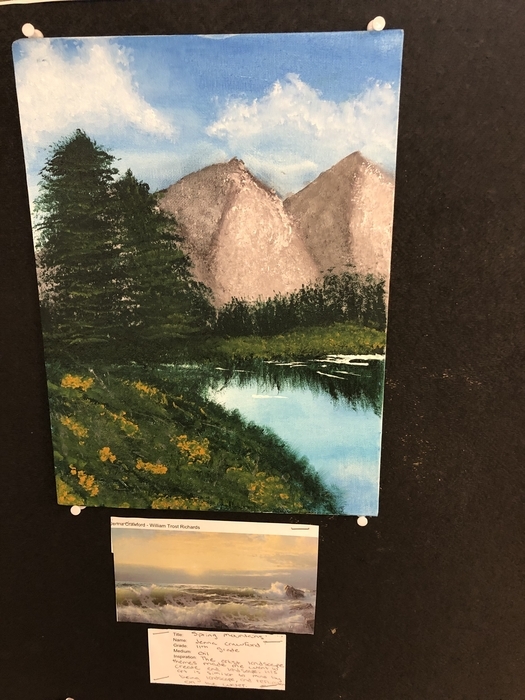 Please do not miss out on the student artwork displayed outside of the Columbia Central Performing Arts Center. Come by to enjoy an AMAZING show, West Side Story. Show times include Saturday at 7 PM & Sunday at 2 PM. 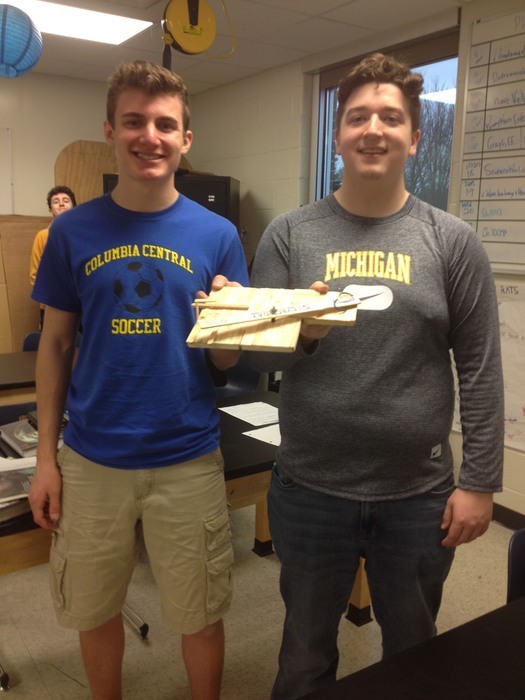 Congratulations to our Principles of Engineering students for winning their classroom competition! Please join us for the musical, West Side Story, and the CCHS/ CCJH Student Art Show this weekend! Art show begins tonight at 6 PM and the musical begins at 7 PM. Please help to support our students and their hard work! Way to go CC! Congratulations to Jenna Crawford, Grace Hetke, Lauren Hitt, Lindsey Stiles and Jensey Tumas for receiving Academic All State. The team also received team academic all state honors and is 7th in the state for division 4 weighted GPA! Way to go CC! The Columbia Central Key Club will be making pies to sell during both lunches for $3 on Thursday, March 14th for Pi Day. Please pre-order your pie. Choose from Lemon, Vanilla or Chocolate Pie. 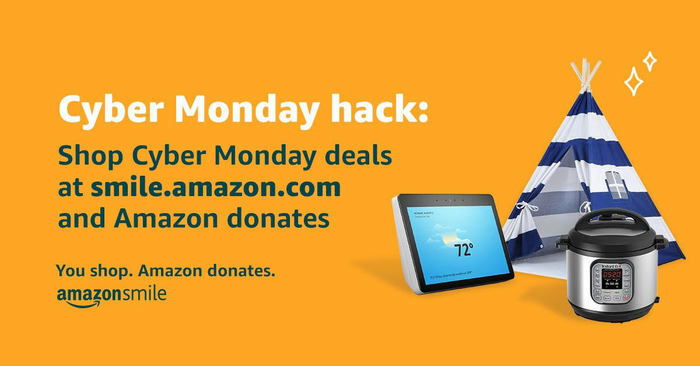 Please turn in your order to the library as soon as possible! 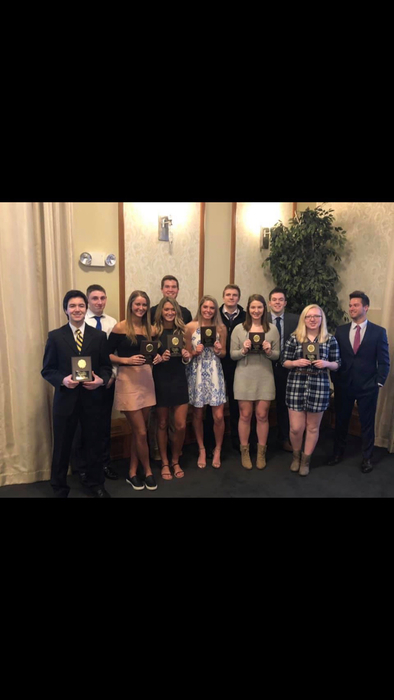 Congratulations to the Columbia Central LCAA Scholar Athletes! We appreciate your dedication to academics and athletics! Way to go CC! 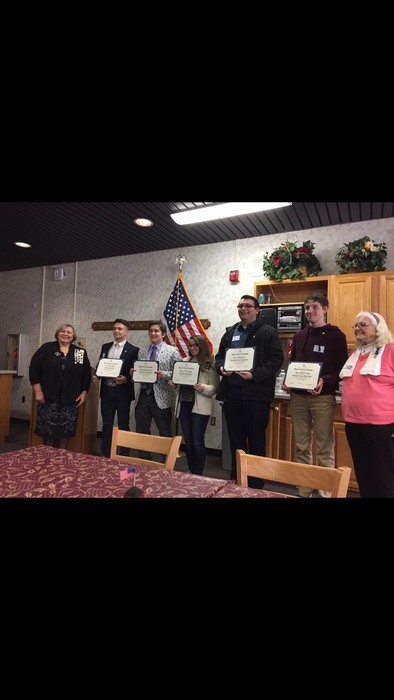 Congratulations to Columbia Central High School student, Joshua Pewsey, for being a Daughters of the American Revolution Scholarship recipient. We are so proud of your hard work and success! Way to go Josh! 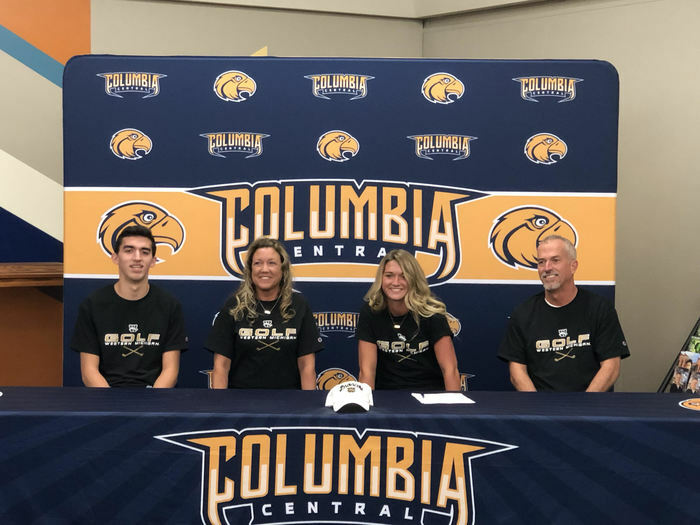 Congratulations to Columbia Central Alumni, Lexi Hall!! Her Cheer Team, Concordia University, won the National Competitive Cheer Championship over the weekend! We are so proud of your continued dedication and success! 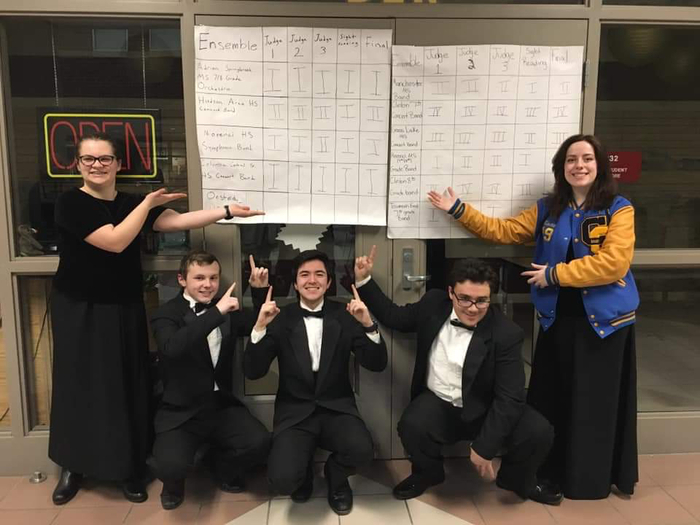 Congratulations to our Columbia Central High School Symphonic Band for earning straight 1’s at festival! We are so proud of your hard work and success! 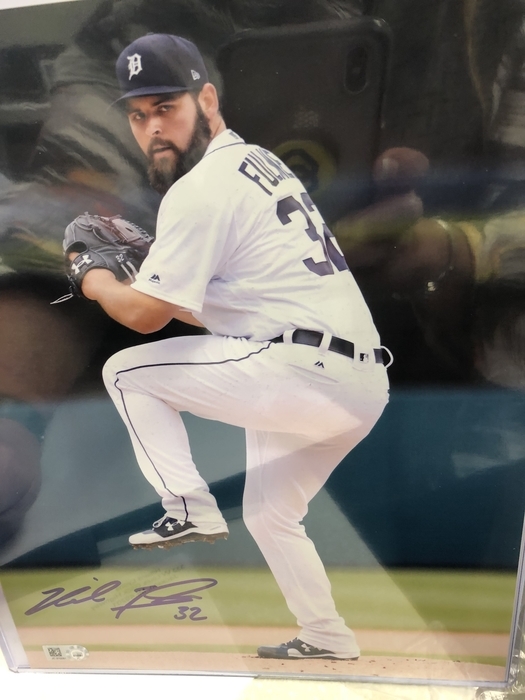 Way to go CC! Interested in making some extra money this spring? The baseball ⚾️and softball 🥎 club is looking for umpires for the upcoming 2019 season. Register through the Golden 🦅 Eagles baseball softball club Facebook page or you may email Dennis Geiger at dgeiger20@gmail.com . On March 25, there will be an informational parent meeting for students interested in attending the Jackson County Early College. The meeting will be held in the CCHS Library at 6 PM. Please join us tonight for the first District Girls Basketball game at Napoleon against Grass Lake. Game begins at 7 PM! Good luck CC! 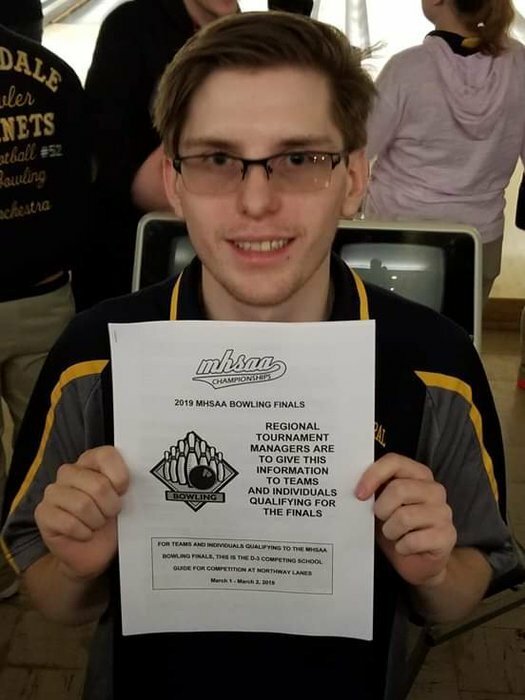 Congratulations to Nathan Sedlecky who bowled at the 2019 MHSAA Bowling Finals on Saturday. He competed well averaging 157 for the day! We are so proud of your hard work! Way to go, Nathan! 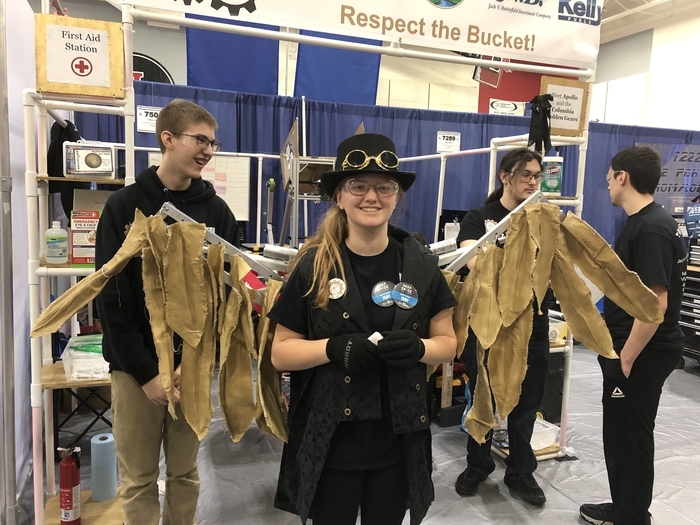 The Golden Gears Robotics Team is doing well in their competition at Kettering University! Way to go CC! 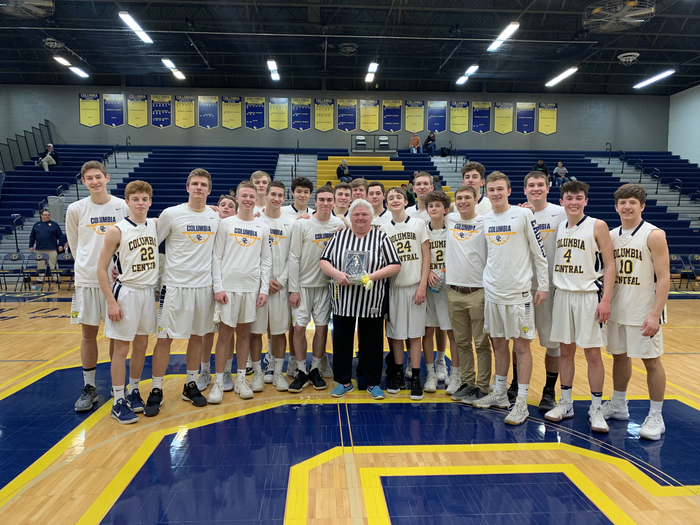 Please join us tonight to cheer on the Columbia Central High Boys Basketball team in the district finals against Adrian Madison. Tip off is 6:30 PM! Cost is $6. Best of luck to the Golden Eagles! Theo Crouse is competing at the MHSAA Individual State Wrestling Meet today! We wish him the best! Good Luck Theo! 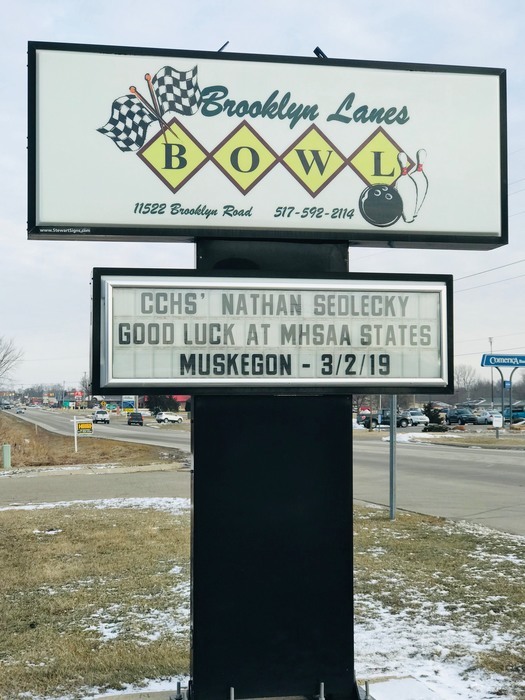 Best Wishes to Nathan Sedlecky who will compete at the MHSAA State Bowling Competition on Saturday!! Our Robotics Team is preparing for their first robot inspection. 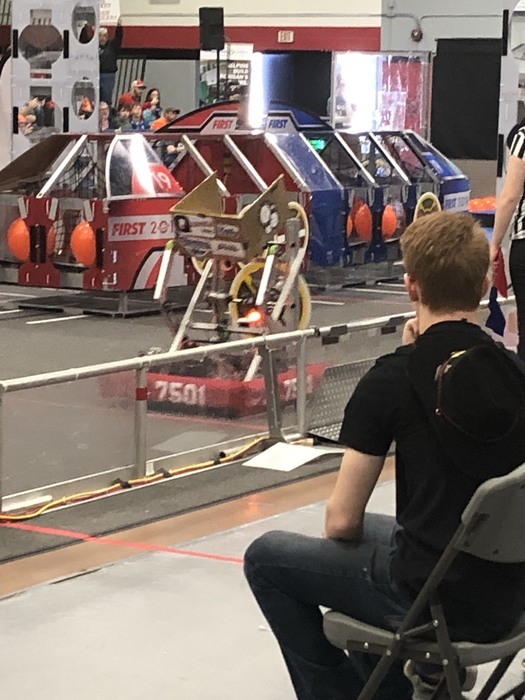 We wish them the best of luck while competing at Kettering University! Attention Seniors-March 1 is the deadline to complete your FAFSA application. Congratulations to our Columbia Central High School Choir on a job well done at Choir Festival! 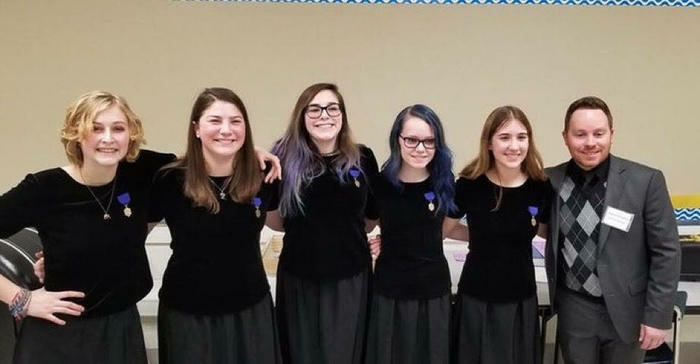 They earned a Good Rating and almost a perfect score on sight reading! Way to go CC! 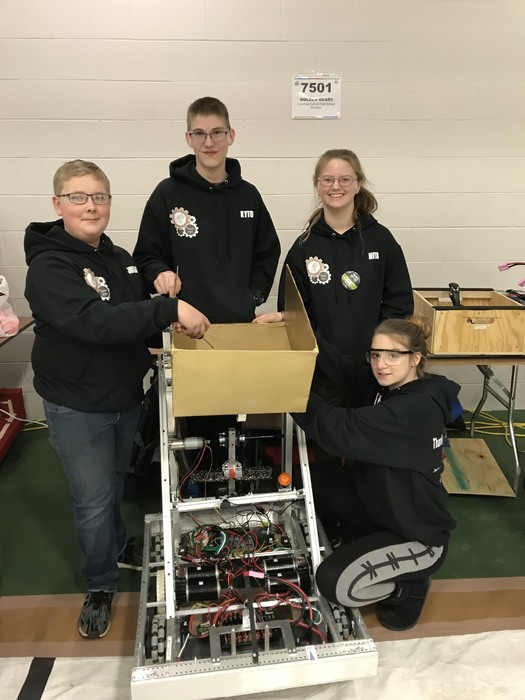 Good luck to our CCHS Robotics Team competing at Kettering University over the weekend! There will be a JAC3 meeting from 5-6 PM in the high school library. JAC3 is a program offered through the Career Center for students entering 11th grade interested in Welding, Manufacturing or Engineering. This is meeting is NOT for the Jackson County Early College. 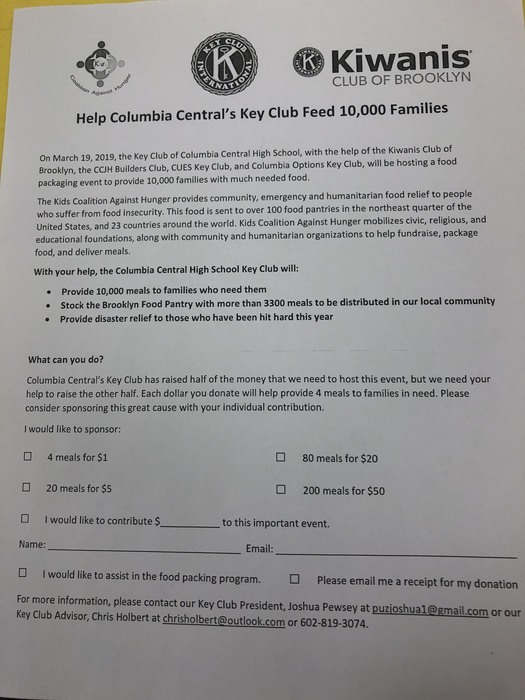 Please help to support our Key Club with their Kids Coalition Against Hunger project on March 19, 2019. 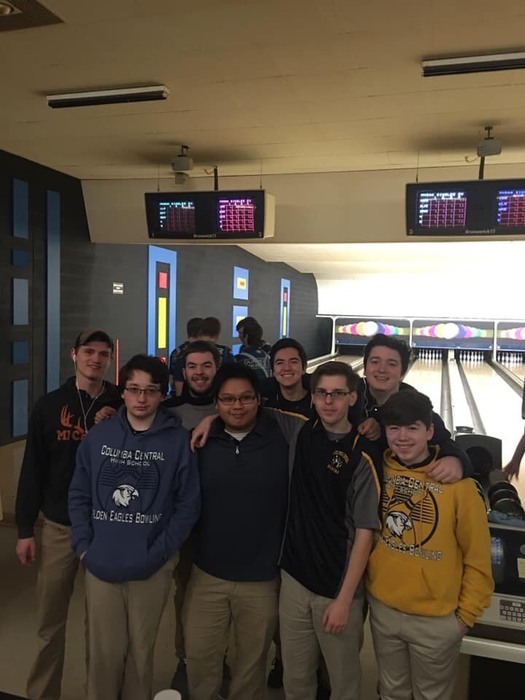 Congratulations to our Bowling Team on a great season!! Nathan Sedlecky earned 4th place at Regionals and will move on to the State Tournament! We are so proud of your hard work and success! Way to go CC! Congratulations to our Girls Varsity Basketball Team who are LCAA CHAMPS!! We are so proud of your determination and success! Way to go CC!!! Columbia Central Clays season is preparing to get started. If you would like to represent Columbia Central High School on the Trap team, Friday 2/22/19 is the deadline. The Jackson Area Career Center will hold an open house tonight from 4-7 PM. Please stop in to visit the variety of career programs offered. The girls basketball games at Hudson will be held tonight. JV begins at 5:30 PM and varsity will follow. Good luck Golden Eagles! Congratulations to our All State Athletes at Columbia Central! 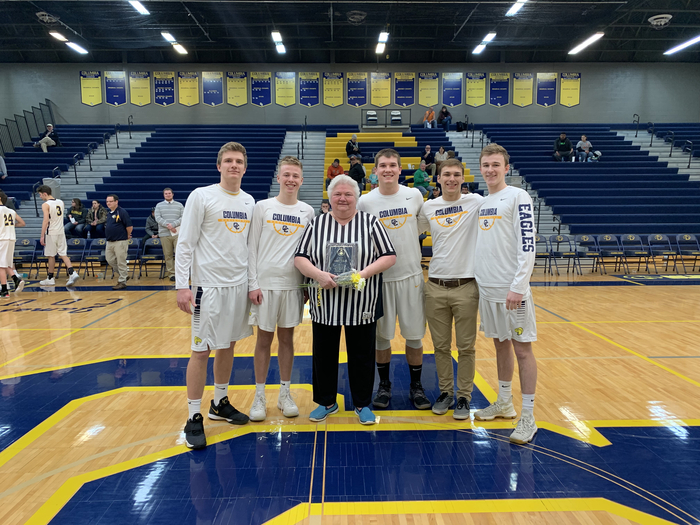 On behalf of the entire Columbia Community, we would like to thank Libby Wolfe for volunteering her time to our basketball program and for making a positive impact on countless students over the years! We are so grateful! 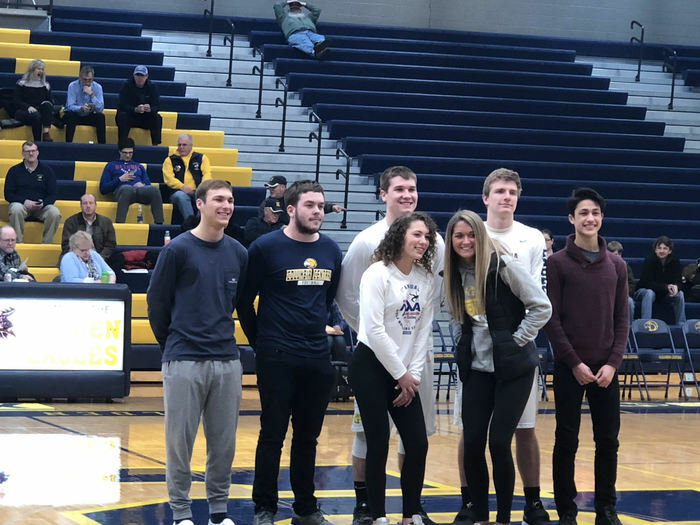 Congratulations to our Columbia Central Seniors! Thank you for your positive contributions to our basketball program! 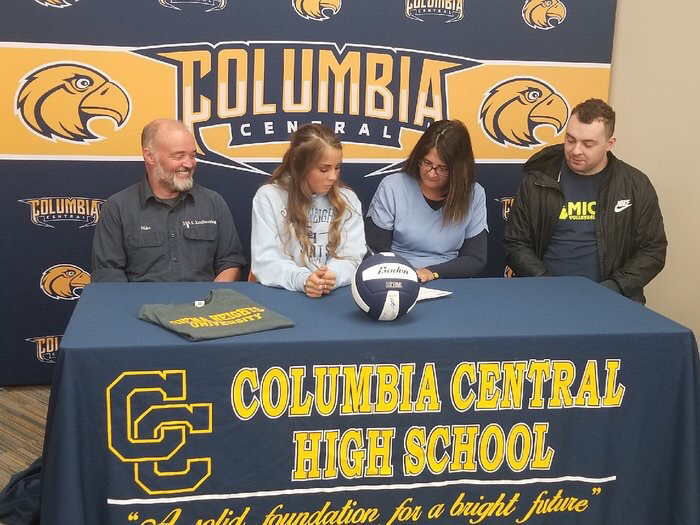 Congratulations to Columbia Central Senior, Abigail Price! Abigail will play volleyball with the University of Northwestern Ohio! We are so proud of her dedication and success! 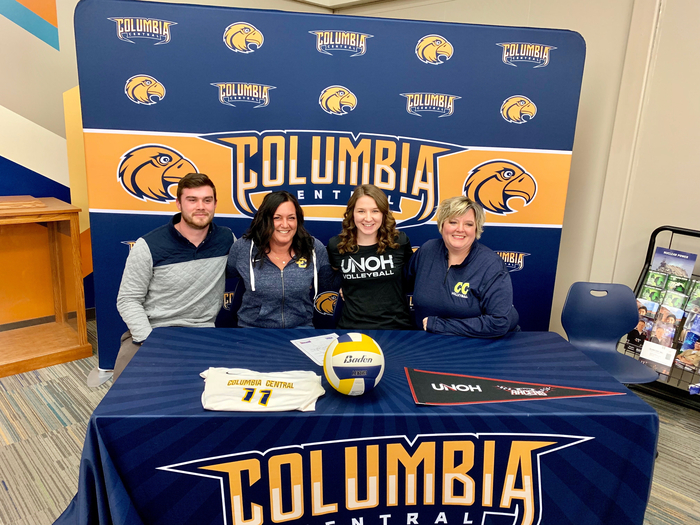 We wish her the best at UNOH! Congratulations to Theo Crouse, Columbia Central Wrestler. He will compete in the Individual MHSAA State Wrestling meet in Williamston, Division 3, Region 12. We are proud of your hard work, determination and success! Attention Seniors-The Jackson Community Foundation has extended their scholarship deadline to Tuesday, February 19 at 5 PM. Visit the College & Career Access Center on Monday, February 18 from 10 AM- 8 PM to complete your FASFA application. Please join us to Bowl for Business Professionals of America Friday night at Brooklyn Lanes from 7-10 pm. $20 for 3 hours of bowling and unlimited pizza and pop. Please support the BPA at Columbia Central! Go CC! Jackson College will be closing at 1 PM today, February 13, 2019. Please join us for the CCHS Girls Basketball game tonight against Ida! We need to fill the gym to support our Golden Eagles! Any high school student who wears blue and gold or the student theme for the night will receive free admission to the game! Good luck CC! There will be a team meeting and team registration for Columbia Central Clays (Trap Team) in the cafeteria on Thursday, February 7 at 7 PM. Please contact the high school office with any questions. Due to inclement weather and icy roads Columbia School District is closed today, February 6th. Child care is open. 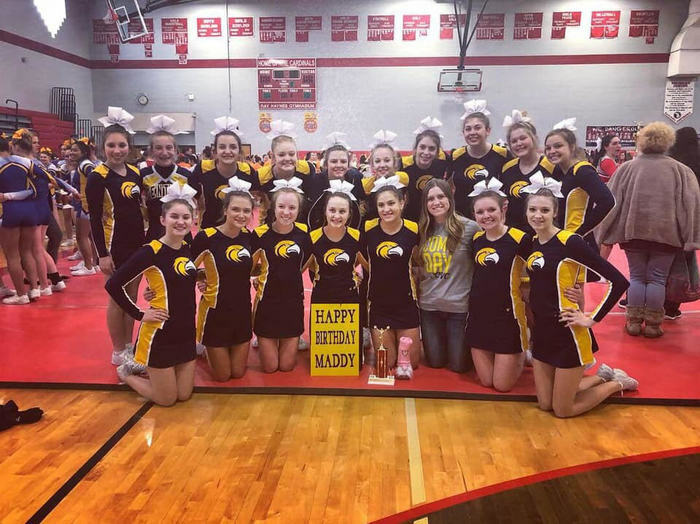 Congratulations to the Columbia Central Varsity Cheer Team for earning 4th place in the LCAA Conference. 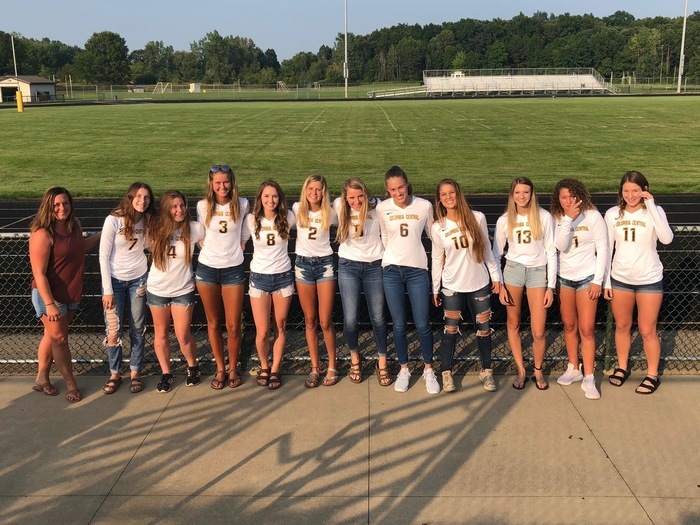 In addition, Jensen Tumas and Jenna Crawford earned First Team All Conference honors. Madyson Curtiss-Rose was recognized with Honorable Mention! We are so proud of you! Congratulations to Mr. Parkinson and his students who attended the CEO Challenge today in Adrian. The Columbia Central team received second place honors for the Business Pitch category! Way to go CC! Coming up! 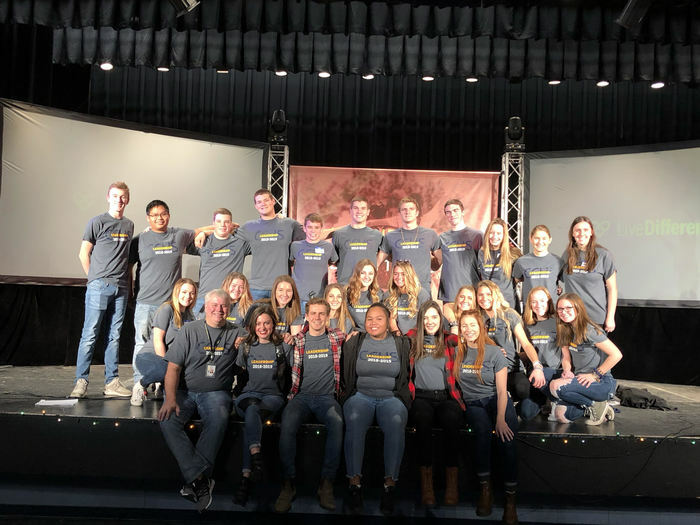 The 6th Annual 💙💛🦅Columbia Performing Arts 🎭 I ❤️ the Arts Dinner and Dance on March 2nd form 6 to 10 pm at the Irish Hills Eagles. Purchase tickets from one of our students! Congratulations to Mercaydeez Scott, MHSAA Girls State Wrestling CHAMPION!! We are so proud of your determination! Way to go Mercaydeez and the Columbia Central wrestling program! Congratulations Columbia Central Wrestling Team! Tommy Ronders placed first and is a conference champion!! Blake Ellison placed third and three others placed fourth, Zach Osgood, Noah King, and Noah Eisenman. We are so proud of your accomplishments and hard work! Go CC! Good luck to Mercaydeez Scott competing at the first Girls State Wrestling Tournament on Sunday at Adrian College. The event begins at 10 AM. We wish her the best! Go Eagles! Good luck to our bowling team competing in the LCAA Jamboree today at Hudson. Go Eagles!! Our CCHS wrestlers are competing in the LCAA conference meet today. Good luck to our team! Go Eagles! The boys basketball game against Erie Mason is rescheduled on Saturday, February 2 at 4:30 PM. The following athletic events have been canceled for tonight: Boys/Girls Bowling vs. Hudson and Boys Basketball vs. Erie Mason. 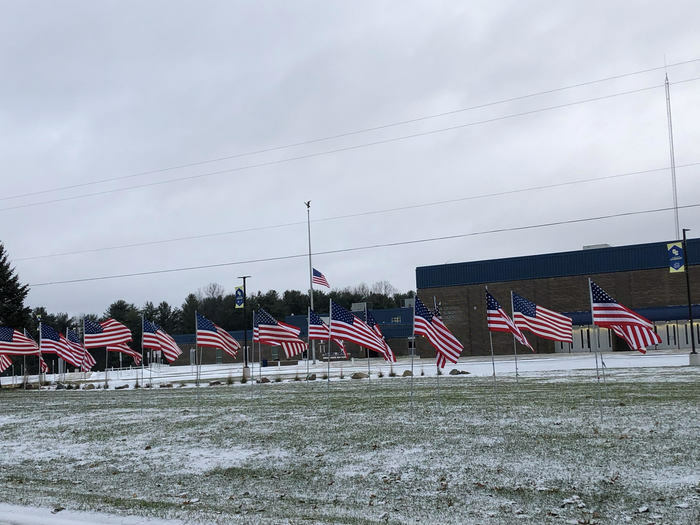 In addition, the Varsity Wrestling match at Onsted tomorrow, 1/30, has also been canceled. Coaches will provide information about make-up dates. FTC Robotics will not be held today, January 29th due to the weather. Congratulations to the Columbia Central Varsity Cheer Team! They work so hard each day toward accomplishing their goals! They earned 4th place breaking a score of 700 at the Michigan Center tournament over the weekend! Way to go CC Cheer! 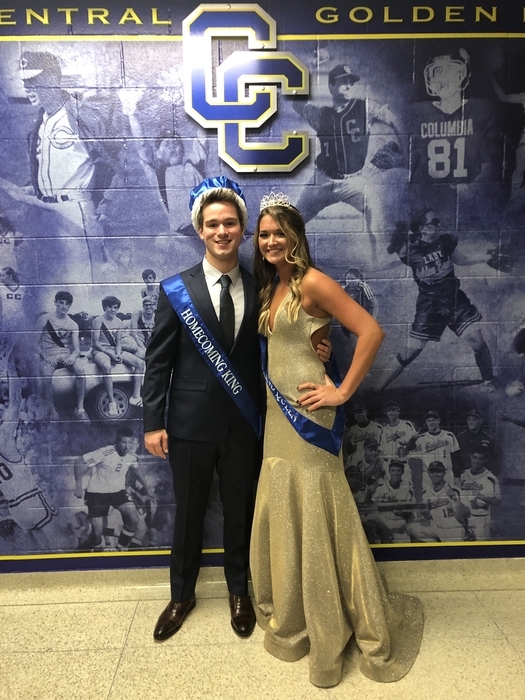 Congratulations to Alissa Fish and Gehrig Elliot, 2019 Winter Homecoming King and Queen! What a wonderful night!! JV and Varsity boys basketball defeated Onsted! 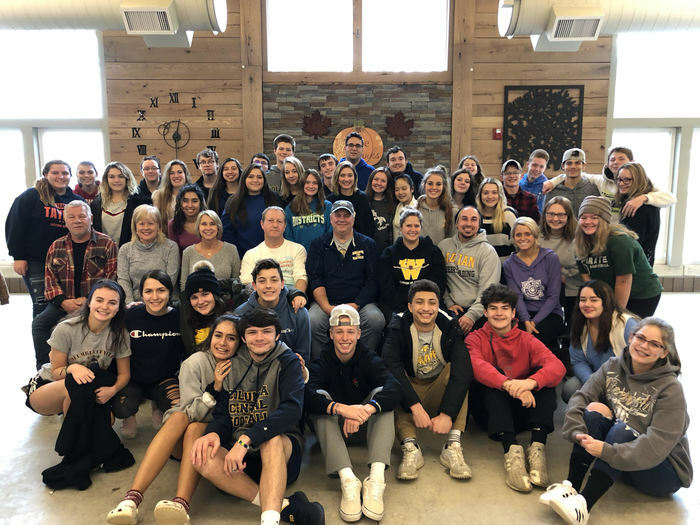 Thank you to our community members who joined us for our Winter Homecoming events! So proud to be a Golden Eagle! All high school students should have received an email to vote for the homecoming court. Please vote only once. Thank you! Jostens will deliver class rings tomorrow during high school lunches. Any remaining balances may be paid online at https://www.jostens.com/. Columbia Central Winter Homecoming is tomorrow. Please join us for BLUE AND GOLD DAY!!! The JV basketball game against Onsted begins at 5:30 PM and varsity will follow. The Glow Dance for CCHS students is from 8:30-11 PM. Cost is $8. Let's go Golden Eagles! 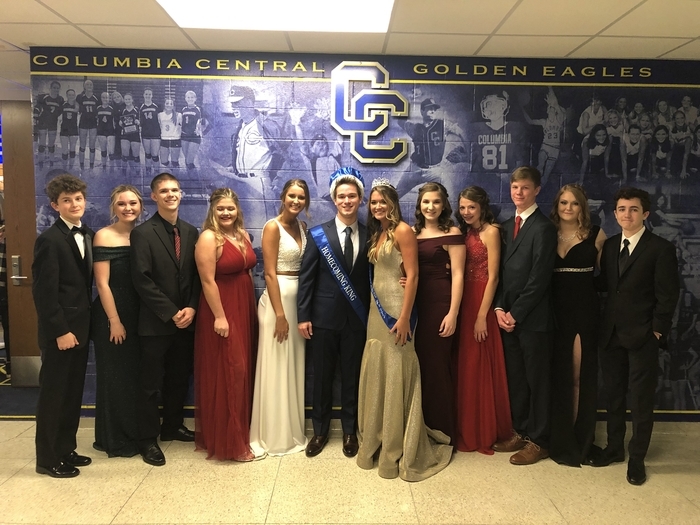 Homecoming Week begins at Columbia Central! 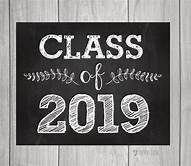 High school hall decorating for students is tonight from 4:30-7:30 PM. We hope to see you there! 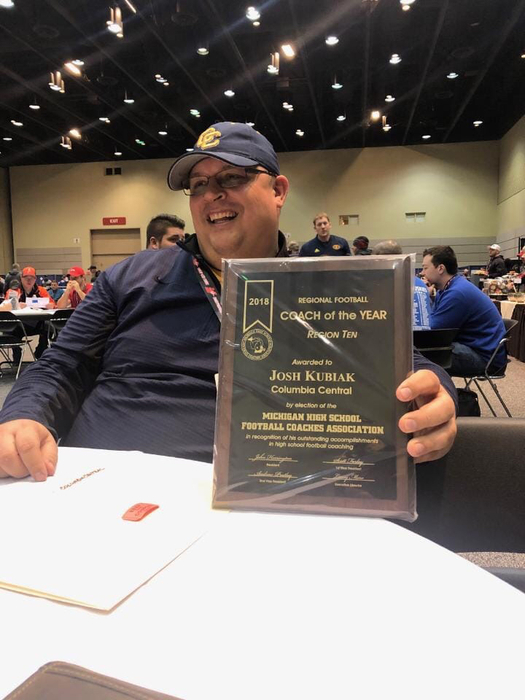 Congratulations to Coach Kubiak, Region 10 Coach of the Year! Thank you for your positive leadership of our football program! We are so proud of you and your team! 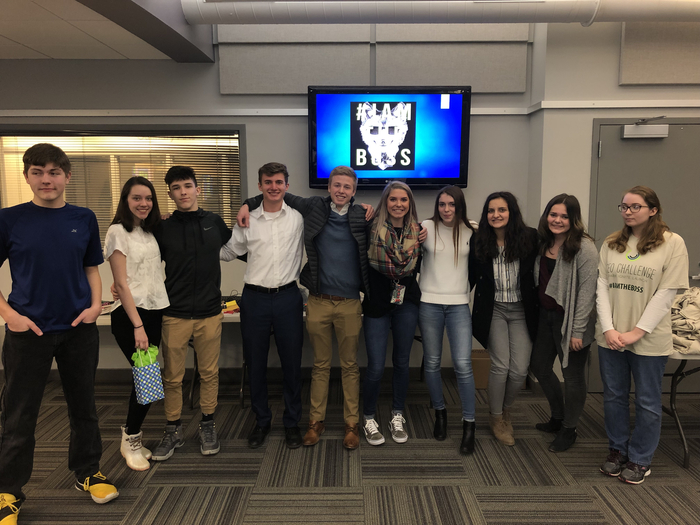 Congratulations to our Business Professionals of America organization at Columbia Central! 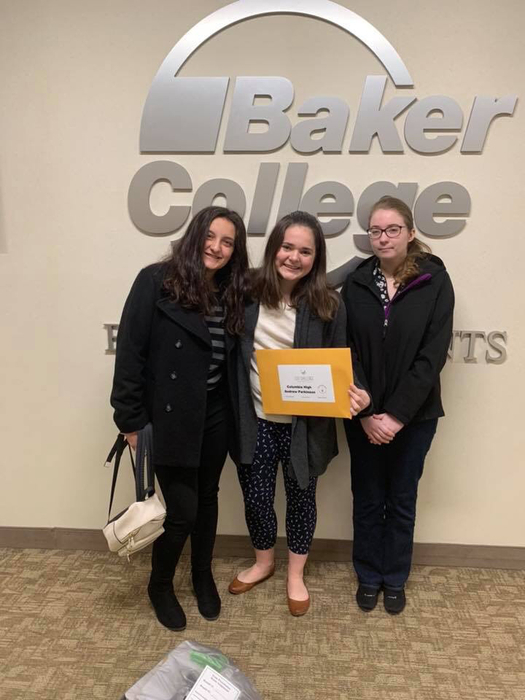 They participated in the Regional Competition at Jackson College this past week. Several groups qualified for the state competition. We are so proud of your hard work and success! 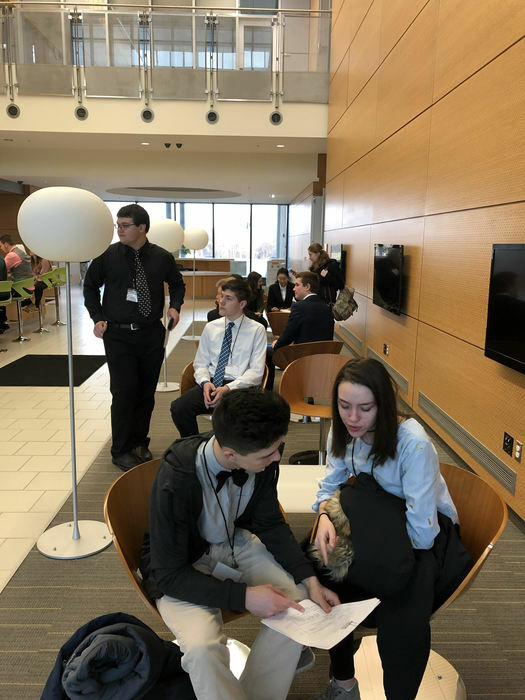 BPA students are competing today in the Regional Leadership Conference held at Jackson College. We wish them the best! Winter Homecoming is on January 25! Homecoming t-shirts are still available for students to purchase through Thursday. The cost is $10. Forms are available in the office. 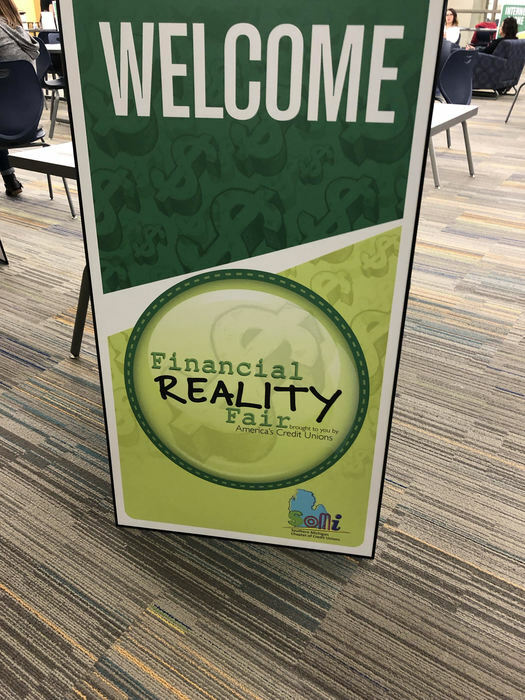 Thank you to CP Federal Credit Union for sponsoring the Financial Reality Fair today for Columbia Central Seniors. Please join us tonight at 6 PM for the first home LCAA Competitive Cheer Meet! Both junior high and high school teams will compete. Good luck to our Golden Eagles! 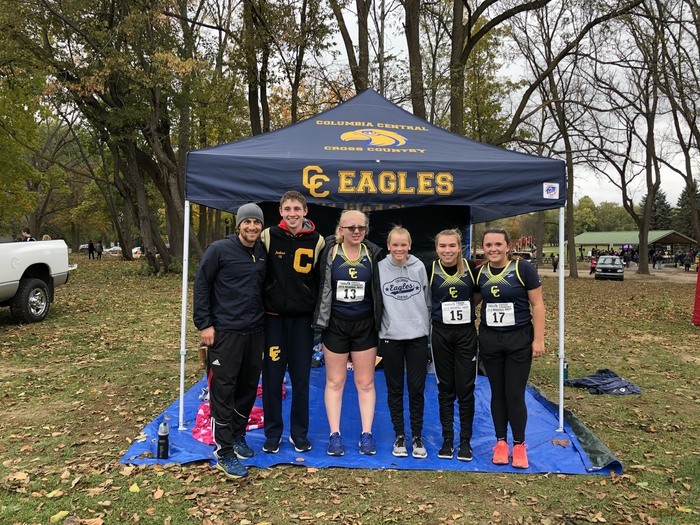 Congratulations to our Columbia Central High School Cross Team on a successful season! Our annual Canned Food Drive is taking place! 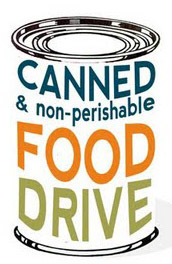 Please help to support the Brooklyn Food Pantry by donating non-perishable items through the remainder of the week. 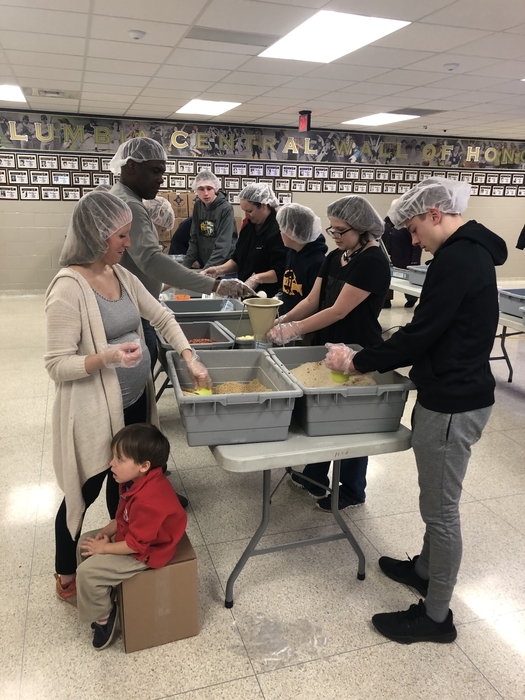 We are grateful to our Leadership Class for sharing kindness in our community! 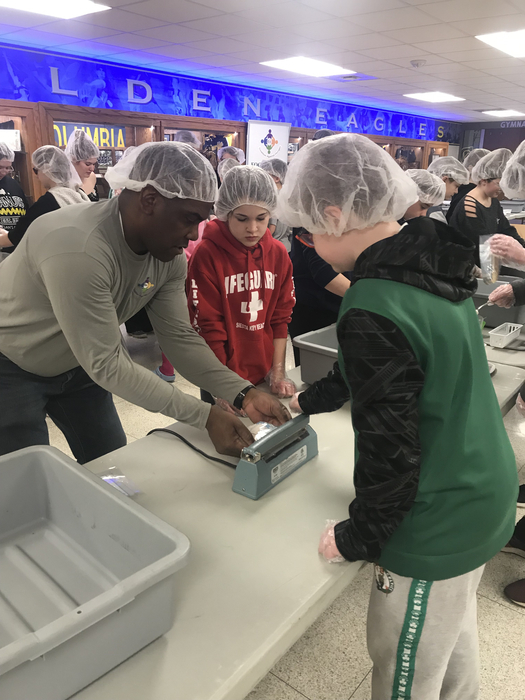 Our school is taking part in the Michigan profile for healthy use Survey supported by the Michigan Department of Education and Community Health. The research survey will ask about the health behaviors of 7th, 9th and 11th grade students and will include questions regarding nutrition, physical activity, and substance abuse. It will also ask about sexual behaviors. Students will have the opportunity to take the survey on December 14. If you object to your child’s participation in the survey please complete the opt out form which is available on our website. You will only need to return the form if you do not give your child permission to take the survey. 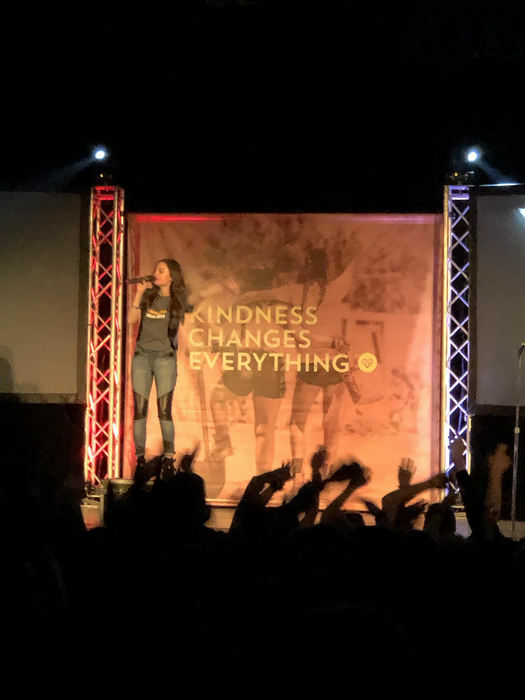 Thank you to Live Different for visiting Columbia Central and encouraging students and staff to spread kindness in our community! We will hold a Saturday School session for high school students on December 8 from 8 AM- 12 PM. Please contact the office if your child plans to attend. Friday, December 7, is the Student Leadership Forum at Columbia Central. We look forward to welcoming many community members and appreciate them taking the time to talk with our students. There will be a mandatory parent/player meeting on Sunday, December 9th at 6:30 pm in the CCHS Cafeteria for all Freshmen through Seniors who are interested in playing Baseball this Spring. 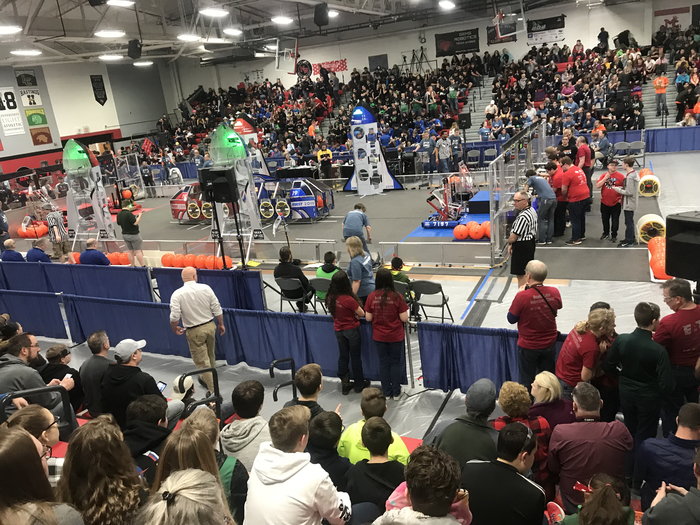 Please join us for the FIRST Robotics Competition held tomorrow at Columbia Central High School. Teams begin presentations at 8:30 AM and will last throughout the day. 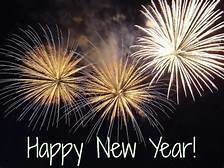 Best wishes to all of the teams! Please join us tonight for the first home Columbia Central Boys Basketball game vs. Western. JV begins at 5:30 PM and varsity will follow. Good luck to our Golden Eagles! Interested in learning more about the Early/Middle College available to your Columbia student? Click the link https://www.jcisd.org/jcec or contact CCHS counselor Wendy.Diefenthaler@myeagles.org . Congratulations to Coach Kubiak! He was named one of the Regional Coaches of the Year by the Michigan High School Football Association! Thank you, Coach Kubiak, for your leadership, dedication and hard work at CC! 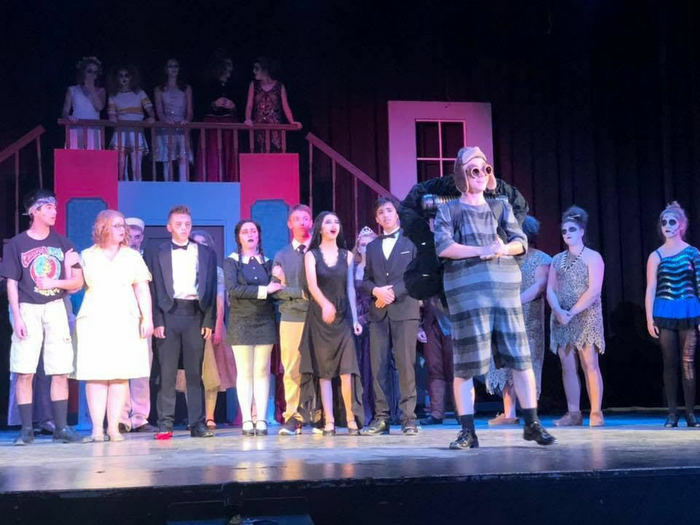 Congratulations to the cast and crew of The Addams Family! We are so PROUD of hard work! What an amazing show! Thank you, Mr. Miller, for 20 years of dedication to Communications Camp at Columbia Central! 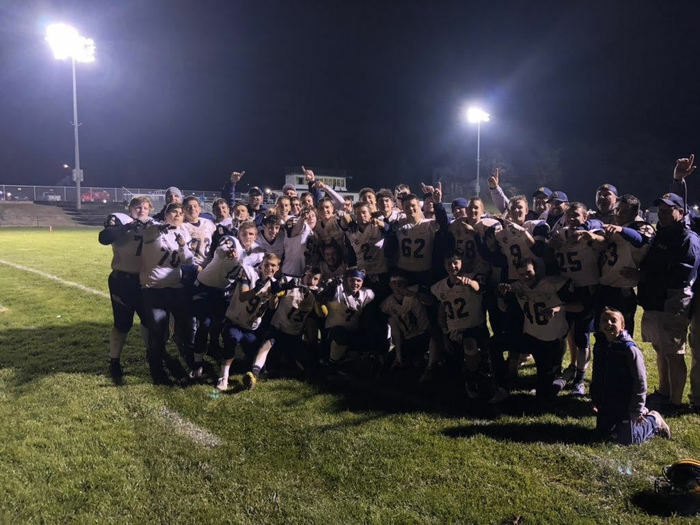 Congratulations to our CCHS Varsity Football team on all of your accomplishments this season! We are so proud of your hard work, dedication and leadership! Way to go CC! 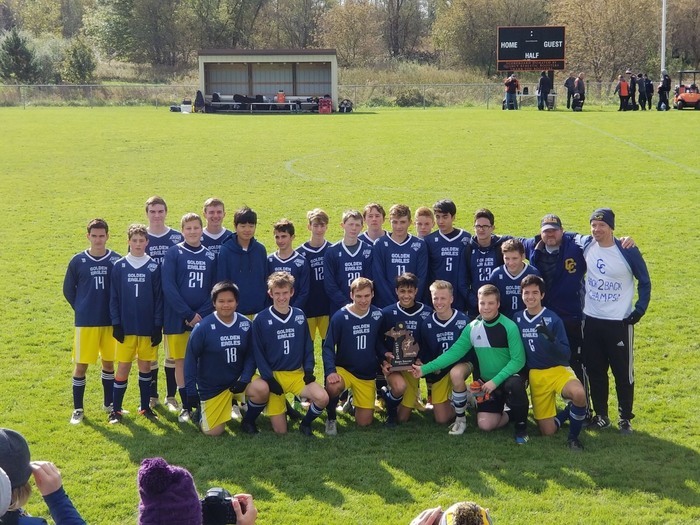 Congratulations to our Boys Soccer Team on your season and being the first to compete in the Regional Championship! We are so proud of your determination and success! 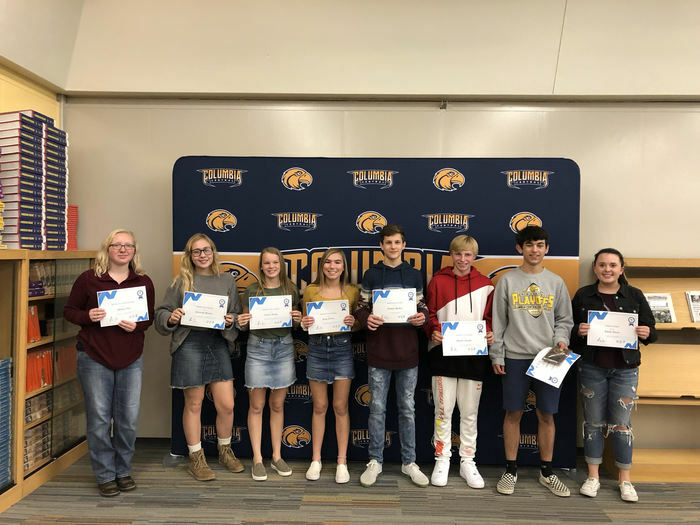 Congratulations to the Cross Country Team on a great season! Trunk or Treat is today, Sunday, October 28th in the CCHS south parking lot from 3 to 5 pm. If it rains, we will be in the Fitness Center gym. Please join the Columbia community Sunday afternoon for Trunk or Treat. 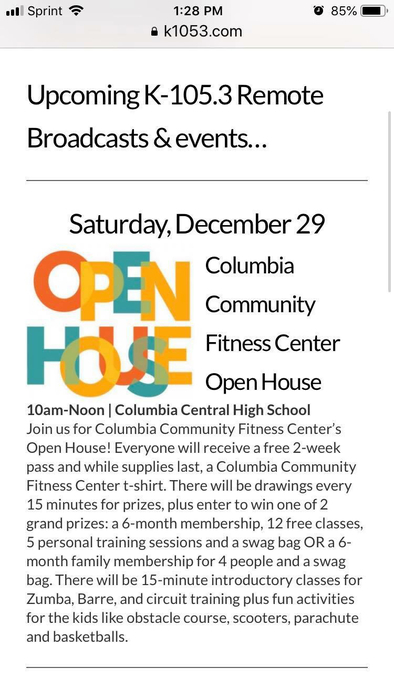 The event will be held at Columbia Central High School from 3-5 PM. We would like to remind families tomorrow night's playoff game vs. Quincy and the soccer regional final at Williamston are MHSAA events. The cost to get into each will be $6 for all attendees. School passes or league passes will not be accepted. Columbia Central There will be a meeting tonight regarding the Jackson Country Early College for parents of 9th and 10th grade, 6:30 PM in the library. Good luck to the Columbia Central Marching Band! 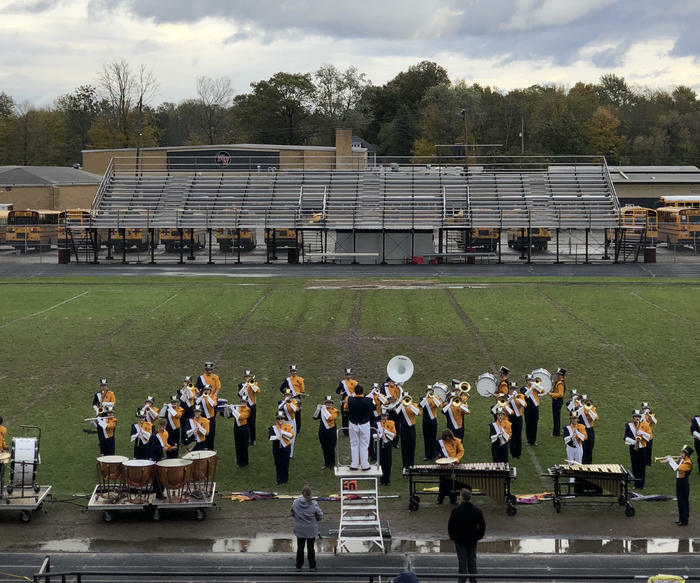 They will finish up their marching season with the MSBOA District 8 Marching Band Festival at Northwest High School tomorrow, performing at 5:15 PM. Go Golden Eagles! Our Girls Golf team is competing in the MHSAA State Tournament and will continue through tomorrow! We wish them the best! #WeareCCExpectGREATNESS! Good luck to our Columbia Central teams: Varsity Football away at Hudson tonight, 7 PM. 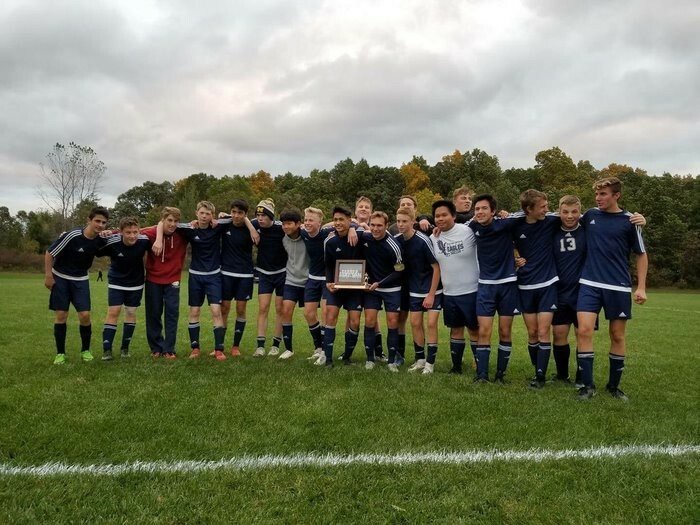 Boys Soccer competes in the District Championship at Quincy tomorrow, 10 AM. JV, Junior High Volleyball, and Cross Country also compete in their conference tournaments tomorrow! Go Eagles! Columbia Central Varsity Football is home tonight! Kickoff is at 7 PM. Lets fill the stands and cheer our mighty Golden Eagles to a victory. Go Golden Eagles!! Congratulations to the Columbia Central Girls Golf Team for qualifying for the MHSAA Girls Golf State Finals in D4!! We are so proud of your hard work and accomplishments! 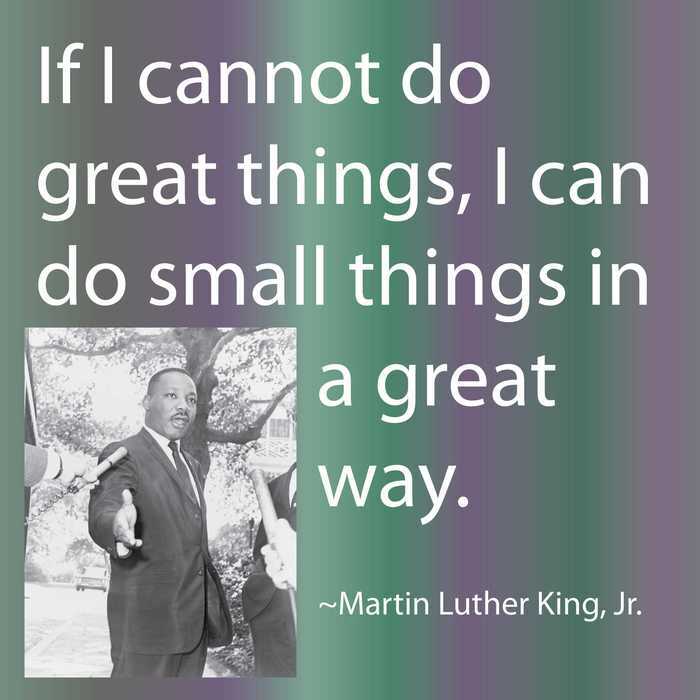 #ExpectGREATNESS! Columbia Central Yearbook will be having a photo booth today at lunch! The pictures will be featured throughout the yearbook. #WeareCCexpectGREATNESS! Columbia Central Homecoming Week begins Monday, October 1st with Celebrity Day! Powderpuff game begins at 7:30 PM! Go Golden Eagles! 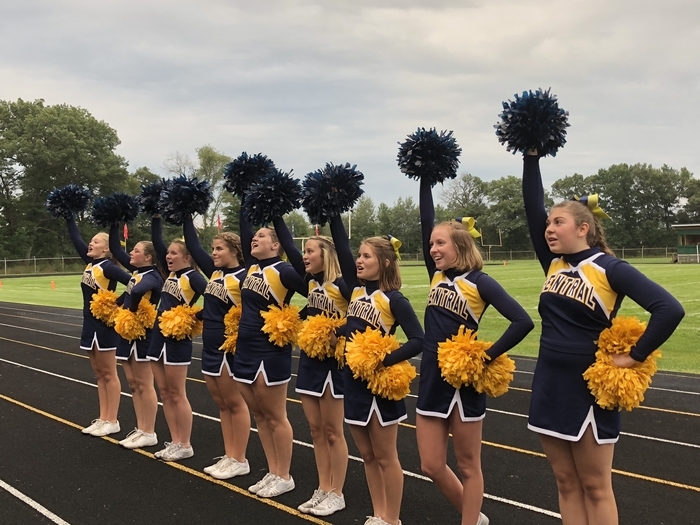 Please join us this evening for the home football game against Onsted at 7 PM. K105.3 will be here tonight as well as the Columbia Central staff. Wear your blue and gold! Go Golden Eagles! Congratulations to our Columbia Lady Eagles Golf Team for breaking a school record this past week and for being 1st place in the IGL. They will play an 18 hole final at Lakeland on Tuesday to make it official. Go Eagles!! Columbia Central High School Parent meeting for the 2020 trip to Madrid and Barcelona will be held Thursday in the CCHS media center, 7 PM. Please attend if interested. 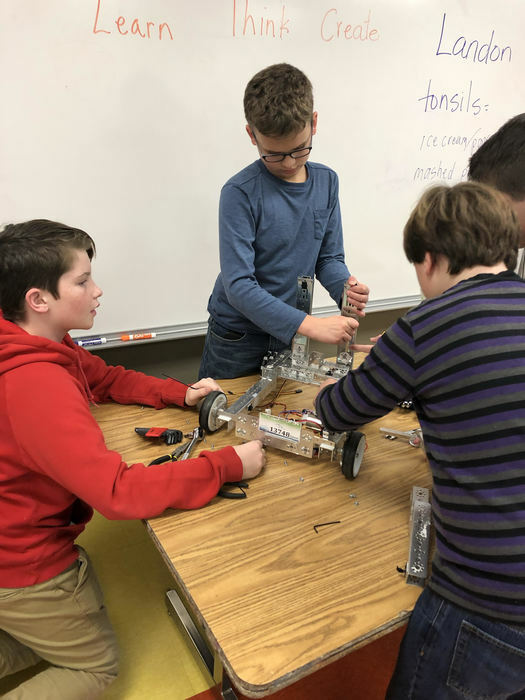 Columbia Central CCJH and CCHS are looking for students to join the First Robotics team. Please see Mrs. O'Neil for more details. There will be a 9th and 10th grade parent meeting for those interested in attending the Jackson County Early College on October 22, 6:30 PM, in the Columbia Central Media Center. Please join us for the home varsity football game tonight against Ida at 7 PM! Wear your blue and gold! Go Eagles! The Eagle's Nest School Store opens Thursday! The first 24 people who visit the store and spend $5 or more will receive a free donut with purchase! Go Eagles! 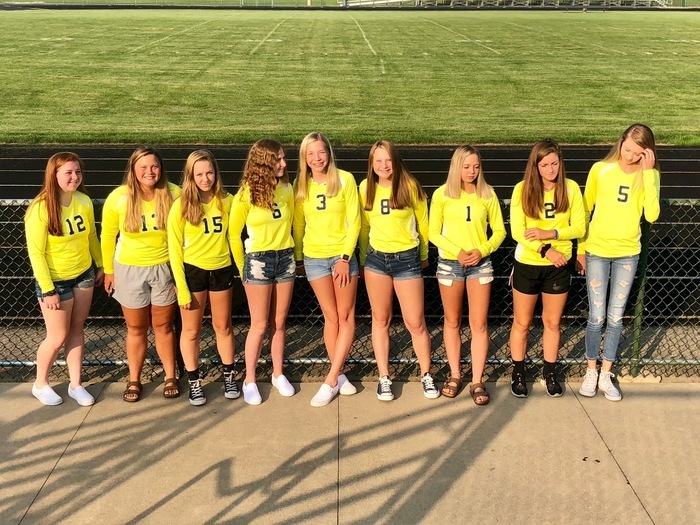 Please join us tonight to cheer on the Columbia Central JV and Varsity Girls Volleyball teams at home against Onsted. JV begins at 5:30 PM, varsity will follow. Good luck to our GOLDEN EAGLES! 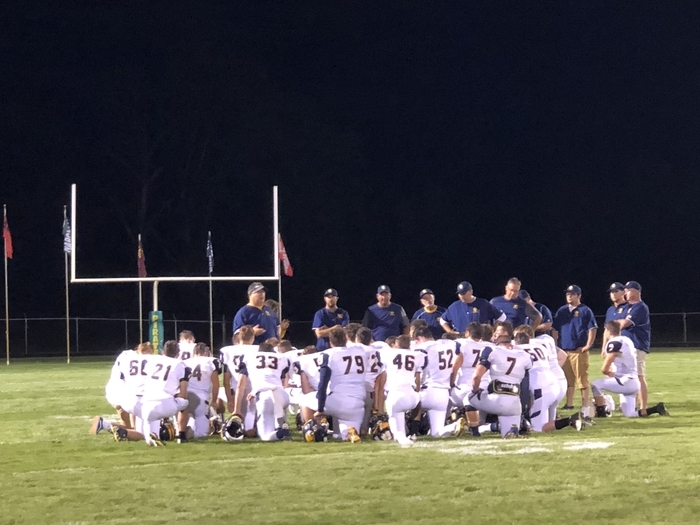 The CCHS Varsity Football team defeated Leslie by a score of 48-20. They played well! Please come to cheer on the varsity football team and the varsity boys tennis team tonight at Leslie!! Tennis is at 4:30 PM and football at 7:00 PM. Tomorrow is Blue and Gold Day at Columbia Central! JV Football second quarter score 12 to 0 CCHS over Leslie! Congratulations! 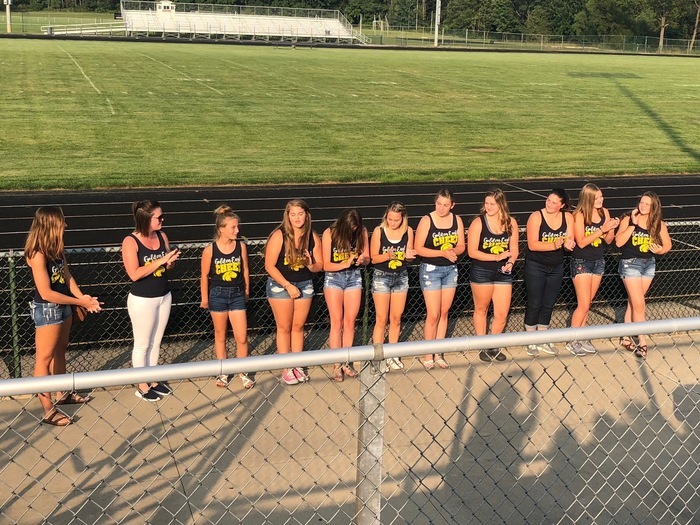 Girl Varsity Golf placed first, defeating Hudson, Onsted, Concord and Adrian Madison! 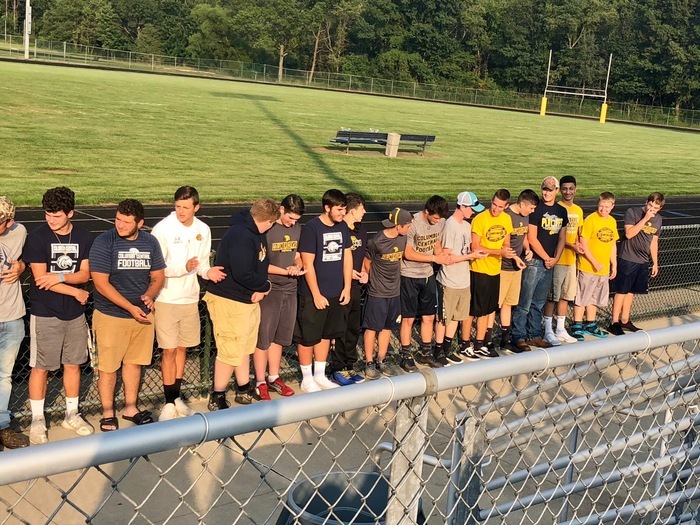 Columbia Central Come cheer on the JV football team tonight at 6:00 at home. Cross country is at East Jackson tonight. Girls golf played today at 1:00. There will be no school on Friday August 31st and Monday September 3rd. 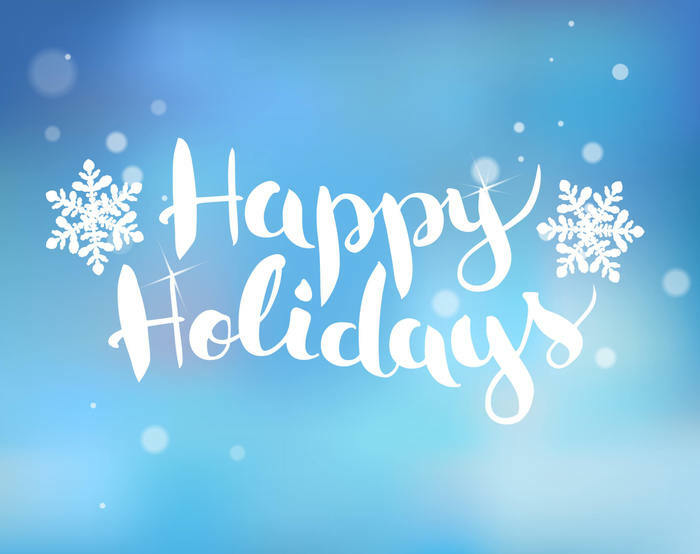 Have a safe and happy holiday weekend. There will be an informational meeting regarding the New York City trip for parents of Seniors on Thursday, September, 6. We will meet in the CCHS library. We look forward to seeing you there! 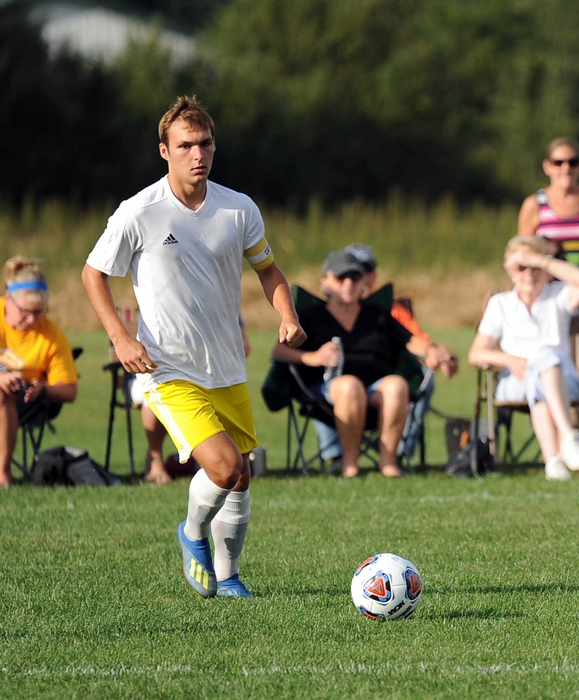 Columbia Central Good luck to boys soccer playing in Machester, 5:30 PM and tennis in Hillsdale, 4:30 PM. Go Eagles! Check out the recap of Jackson area Friday night football. Good coverage of the CCHS win over Napoleon, 24 to 0. 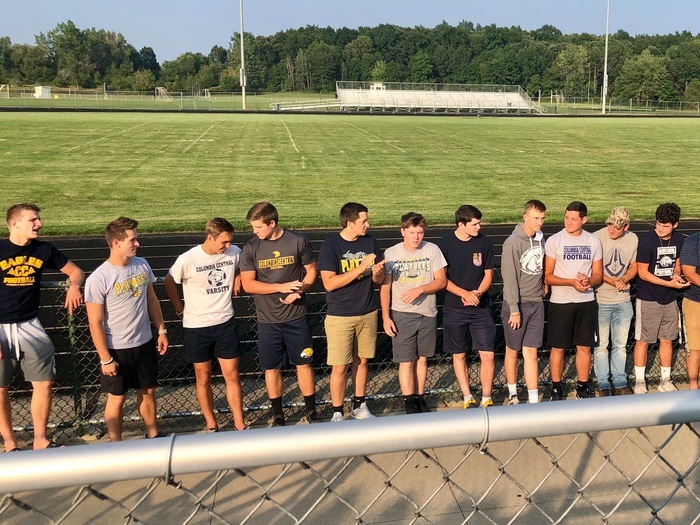 Columbia Central: Please join us tonight for the first home JV football and boys soccer games. Soccer begins at 5:30 PM and JV football at 6 PM. Congratulations to our fall 2018-19 Student Athletes! Congratulations to our 2018-19 fall student athletes! Columbia Central: Please join us for the Fall Sports Picnic Sunday evening at 6 PM being held at the CCHS football field. Columbia Central: Please join us for the CCJH/HS Open House Monday evening from 6-7:30 PM. Columbia Central - Congratulations to our boys soccer team for placing third at the Cougar Cup Tournament today! Go Eagles!